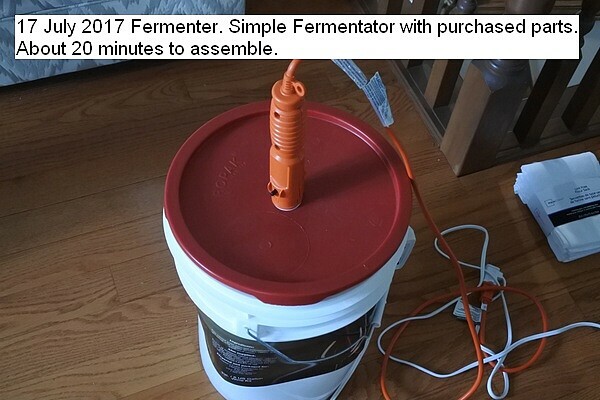 After an internet perusal of the presented fermenters or incubators it was decided to make a simple unit from common readily available parts. The parts are: A 23 liter bucket from home brewing wine store, a muscle heating pad wet/dry with Low, Med, High switch from a pharmacy about 14 by 11 inches, a 20 watt LED with a dimmer switch from a local hardware to fine control the temperature at 31C, a trouble lamp socket with cord for the dimmable LED bulb, A simple stand from shelving area of a hardware store to set the trays on, a cheap bulb thermometer. The only tool required is a soldering iron to burn a hole in the lid of the 23 liter bucket to install the dimmable LED. Construction should take only a few minutes after acquiring the parts.